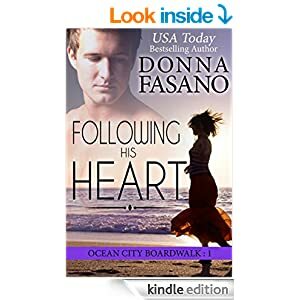 Following His Heart, (Ocean City Boardwalk 1), Donna Fasano. I’ve read a couple of Donna’s books now, and they’re perfect stand alone romances, which after all the serialized ones that are so prevalent now is a real treat. This is labelled Ocean City One and I’m making an assumption that Sara’s friends Cathy and Heather will be getting their own books. I love those kind of connected romances, where we already know some of the characters and their story, but each book focuses especially on one person. Anyway, this book is Sara’s story. She’s living with her mum, though in separate flats, and has a bakery in the same building as her good friends have their businesses, a cafe for Cathy and a B&B for Heather. Landon comes to the rescue in a somewhat dramatic fashion one morning when the ancient pipes break suddenly, which could spell disaster and great expense for the trio. ( and I love the “lose my cookies” part! ) I love Sara, she’s clearly had some past problems with her mum being disabled and needing her help and her husband dying in an accident, and yet she’s always cheerful, always ready to help people. She’s in need of some good news, and when Landon arrives in town there’s an undeniable attraction between them, and her friends try to push them closer. Landon, he’s a lovely guy, with a strange story of how he arrived in Ocean City, and some secrets he’s keeping but he happily jumps in and does the essential repairs saving the girls from disaster, then offers to see to all the plumbing while he’s there, and Sara lets him stay in her flat while she moves downstairs with her mum. Sara and Landon soon become very close and he’s always in her company it seems, joining her on deliveries, cooking her meals, and even joining their famous monthly girls night out. All looks good but he feels he has to level with Sara when he decides to stay around the area, and she’s shocked, gobsmacked at what he tells her, and it brings back some bad times along with a whole fear for the future. She’s not sure at one point if Landon has just played her, and she avoids him after the big reveal….her mum and friends are so sad – it looked as if finally Sara had found something good in her life and they think she’s over reacting. I really felt for both of them, for Landon, though he’d lived with the feelings and dreams for so long it was more a confirmation of an idea for him than a shock, but poor Sara was totally floored, a real bolt from the blue. When the premise first came up she was kind of “its possible but not really” and never really believed it, thought it was all wishful thinking, dreaming and imagination, so when she gets concrete proof she’s scared, doesn’t know how to react or what to do and to be honest I really understood that. It must have brought up a reminder of the bad times and the grief she went through. Its going to take a lot of acceptance on her part to bring them back together, but its the kind of happy ending so many people would love in real life. I’ve read about the phenomenon in this story before, and it’s something that’s well documented empirically, though there’s still not scientific proof. I often think things that appear scientifically impossible are often just problems that we’ve not yet got that far in science to prove. Think of how electricity, telephones, cameras, televisions etc would have been viewed years ago. Vaccinations stopping sickness, people able to travel by plane, train or car etc all would seem impossible before we knew how to do them, and maybe this is just one of those things where it happens but we can’t yet work out why. Stars: Five, its a great solid read, a lovely story, though one I’m unlikely to re read.